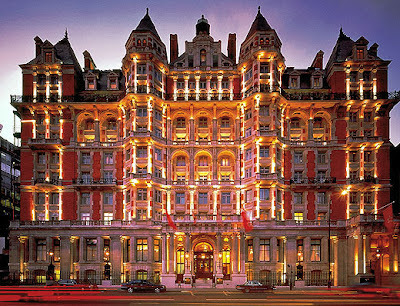 The Mandarin Oriental Hyde Park: it's fancy and it smells Isfarkand-y. One of the traditional perks of fashion editors is the promotional event: a lavish party celebrating milestones (or even just milepebbles) in the journey of a style or beauty brand. Of course, the more seasoned the editor, the less perky these perks come to seem, which leads to the kind of P.T. Barnum approach we saw with Stella McCartney's fête/runway show/magic display/dance performance/fabulosity extravaganza the other night at London Fashion Week. My first promosexual event since I touched down in London last week was the launch of Ormonde Jayne's Isfarkand bath line as the Mandarin Oriental Hyde Park's signature in-room toiletries. A coup for Ormonde Jayne, and a nice match for the London branch of the five-star hotel, who sought to burnish their British location with a best-of-Britain perfume brand. But as we sipped our Ormonde Jayne cocktails (gin, rose water, orange bitters, cardamom and lime syrup), OJ perfumer Linda Pilkington fretted at the word “toiletries”, finding it a bit déclassé. “Maybe 'amenities' would be better?” she offered. “'Hotel amenities',” I mused. “Sounds like prostitutes.” The Mandarin Oriental manager shot me a look. “What are you going to be like after a second cocktail?” he muttered under his breath. “Well-behaved” was the answer, because the group immediately sat down to a fancy-pants meal of saffron risotto with scallops in orange sauce, followed by a mandarin parfait dolled up with lime dacquise and chocolate bergamot coulis. This was the chefs' edible interpretation of Isfarkand, although a loose one, as there is no shellfish to be found in the scent, obviously. As we dined, Linda began to detail her special history with the Mandarin Oriental. I ventured a guess: “You lost your virginity here?” (Boy, that Ormonde Jayne cocktail sure was packing a punch.) Sadly, the reality is somewhat more tame: she became besotted with the luxury hotel after a chance cup of tea in the Hong Kong location 25 years ago. For anyone seeking to enjoy a cup of tea -- or indeed, lose their virginity -- at the Mandarin Oriental Hyde Park, don't miss the limey, woody, peppery pep of Isfarkand, which is carried through shower gel, bar soap, shampoo, conditioner and body lotion. Oh you . . . saucy! I can totally picture editors and promo-throwers not knowing whether (or if!) to wholeheartedly embrace your blunt-edged charms. Just give 'em time. Soon enough, they'll be giggling and trading the latest Katie-isms via text and Twitter. "Can you believe that she said . . . ?" Those Mandarin Oriental Hotels sure are fancy. My boyfriend surprised me by taking me to the Paris location at the new year (and proposing on the same trip! ); the bath products on hand were from Diptyque - the Saint Germain line - which will forever remind me of Paris. The London location sounds just as swanky as its Parisian cousin. I wouldn't mind seeing Ormonde Jayne in my hotel room at all. The products, not the woman. Not that the woman isn't lovely - I'm sure she is - but that would just be weird. The promotional event sounds fabulous, by the way. I can't imagine ever tiring of glam parties like that, especially if they're centered around fragrance. Wowie! What a beautiful experience you had. And now the Mandarin Oriental will forever be a part of your love story. "burnish their British location with a best-of-Britain perfume brand". I am with Linda on toiletries being déclassé, just as the word "toilet" itself is "Non-U", along with the printed "notepaper" that you also find in hotel rooms of this calibre, or the "settees" you find in the suites at least. And of course "suite" is also déclassé when it means a configuration of "settee" plus two armchairs. I understand from watching Hotel Babylon that the code for prostitute in high class hotels is "an extra pillow". Vanessa, now that I'm in London, the word "toilet" (as in the term for what Americans call a "restroom") is causing a lot of multicultural confusion. Mainly because I shy away from saying it, as it sounds so descriptive of what one plans to do in the "little room". (You know how euphemistic Americans are with these kinds of things.) So instead I ask for the "lavatory" when in stores, and none of the Italian/French/Latvian shop assistants have the remotest idea what I'm talking about. So then I say quickly, like an auctioneer: "WC-loo-restroom-powder room-john" and it's not until I hit the magic word "toilet" that the smile of comprehension appears on their faces and I receive my hard-earned directions to execute my toilet business. Oh, and the fastest way to confuse a British person is to ask for the bathroom, because they literally think you intend to take a bath. Seriously? I always ask for extra pillows and all I ever get are...extra pillows! Katie, I love your sense of humor. It makes me feel at ease. So pleased to supply ease, my dear! As a Britisher, I must say there is something really hilarious about being asked where the restroom etc is, and what great fun it is to act bewildered by the request until the person is forced to say toilet, at which you point you can roll your eyes, as if to say "oh you need to pee! Now, why didn't you just say that?" It's true that it makes an American uncomfortable to have to call the "restroom" a "toilet". Like it's one big toilet that you enter. And then it's funny to realize how primly euphemistic the term "restroom" is. Sounds quite Victorian. Funnily enough, the last time I remember this happening was with a snooty voiced English woman, who came and asked me where the restroom was. As I instinctively didn't like her (more for her attitude than her use of the word 'rest room) I pulled a puzzled a look and said, "we really don't have any rooms that customers can rest in, but I can go and get you a chair if you would like to sit down." She then had to say "toilet", and somehow because I had suggested that she needed to sit down, her actual need was made much more obviously graphic than if she had just said toilet in the first place. I pointed out the ladies, and then laughed a lot as I watched her run from me. Americans are usually far too egalitarian for one to feel the need to pull such pranks. This whole thread is so funny I snorted. "Crapper" is so unequivocally literal that I don't think there would be a moment of hesitation in comprehension. Okay, so your "where's the crapper?" crack has now opened up a whole new level of inquiry. It so happens that in my friends' lovely old Bloomsbury house where I'm staying in London, some of the toilets (the actual lavatory fixtures, not the rooms themselves) have "The Venerable Thomas Crapper & Company" stamped inside the bowl. I instantly realized that "the crapper" must stem from the Brits and Thomas Crapper's association with toilets. Wikipedia fleshes (or should that be "flushes") out the subject with info on Mr. Crapper (a plumber who invented the ballcock - oo-err - as well as the concept of sales showrooms for bathroom fittings), and the detail that the word "crap" already existed in Middle English, and stems from a Latin word meaning "chaff". So it's a funny coincidence that Thomas Crapper ended up with his name emblazoned inside toilet bowls. Coincidence...or fate. Great article as usual, and I am looking forward to smelling Isfarkand at some point, as lime is my citrus of choice, and seems to be quite fashionable in all its mojito associative glory, at present. Haha! You really are cheeky! I thought you used to live in London when you were in the whole music scene? Living in London, I got used to using the word "toilet" because as you say, other words don't work! Toiletries just sounds old school and European to me because of all the "La toilette de venus" paintings. How could you not feel special with cupids helping you dress? Yep, I lived in London for a long time, doing music, dance, TV, writing, and using the word "toilet" always got the job done, so to speak. I don't find the word "toiletries" common - I'm with you on the cupids concept.